It's heeeere! Another post in my #TheInternDiaries series! 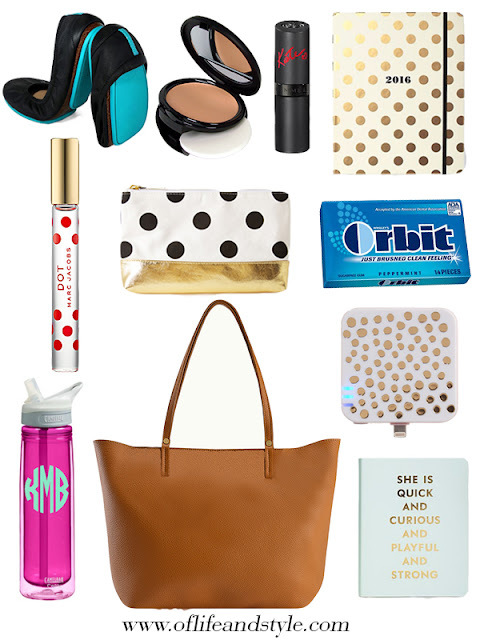 Today I'm going to be sharing my must haves for your purse/work bag. These are things that I take with me every time I go out to a meeting. I am never without them and are always packed with me! So what are my must haves? And yes it is just a coincidence that everything is polka dots.... I didn't realize it until I was writing this post. Lol. I always keep a pair of flats or sandals in my bag at all times. I like changing into these if my feet start hurting or I know I'm going to be walking downtown or all over and don't want to ruin my heels. I try and keep powder or a compact in my bag for touch-ups, especially if I am going to be out all day and need to freshen up before my next meeting/event. Lipstick is a must have. I never leave home without it. I usually take whatever color I'm wearing that day and have a fun color in my bag if I want to change it up. A planner really is a no brainer. I carry mine everywhere and use it religiously. Almost my entire life is planned out in that thing and I would probably die if I lost it. No joke. I like to keep either a rollerball or little spray bottle of perfume with me to freshen up from meeting to meeting. To hold all of my makeup and small miscellaneous items I usually have a cute makeup bag or pouch. I'm one of those bags inside of bags girls and it just keeps everything in place and not rolling around my bag. Gum is essential for me. I'm a compulsive gum chewer so I have to have it on me at all times. Plus, minty fresh breath. If I know I'm going to be out all day I take a double walled water bottle with me. It's super handy to have especially in the summer heat. 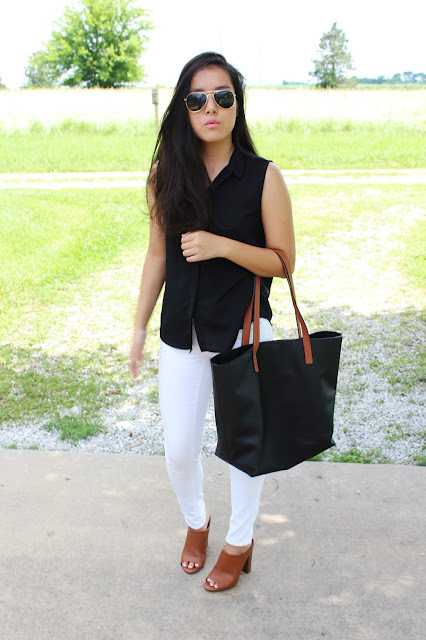 A large bag/tote is oh so necessary to to carry all of your stuff in! I also usually take my laptop and charger with me if I'm going to be meeting with Kat. So a big bag is a must. 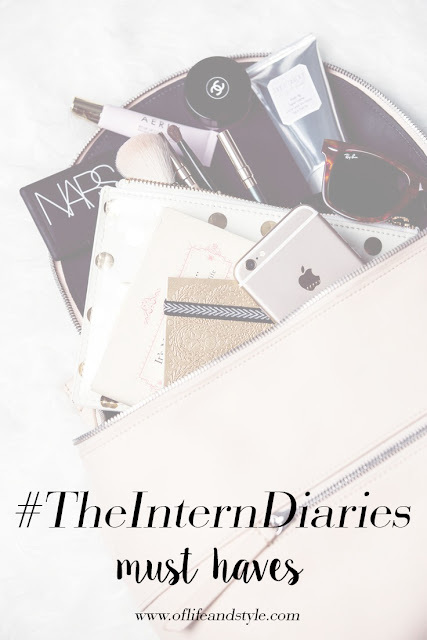 Being a PR/events/social media management intern I am constantly on my phone. Whether it's checking emails, snapping pics or uploading content to Instagram my phone pretty much never leaves my hand. A backup battery is crucial. I can't tell you how many times my phone has died on me right in the middle of something important. Lesson learned. The last thing I always carry with me is a notebook and pen. I'm old fashioned and prefer to write everything down on paper than on my phone. I usually always take notes of what I need to do, events coming up, assignments, emails to send, lists to make, etc. Obviously I always take my wallet, phone, laptop/charger, etc. with me. I didn't include them because they're not super interesting. Lol. That is everything that I always, always, always keep with me in my work bag. Other miscellaneous things are my wallet, chapstick, keys and phone! What do you carry in your work bag? Anything I should add? Leave me a comment sharing! "i like big bags and i cannot lie"
Hello everyone and Happy Sunday! I hope you all had a great week and stayed cool. Here in Kansas we had heat advisory warnings for pretty much the entire week. To be honest I'm so ready for fall now. Bring on the sweaters and boots! 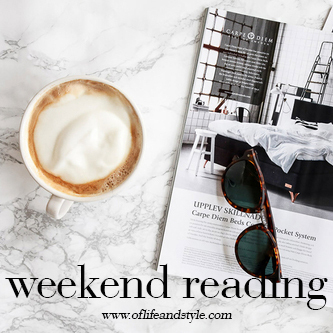 This week's Weekend Reading list is back to it's normalish length and is chalk full of great reads! So let's get to it! Everyone loves a good s'more in the summer. But these s'mores just leveled up. 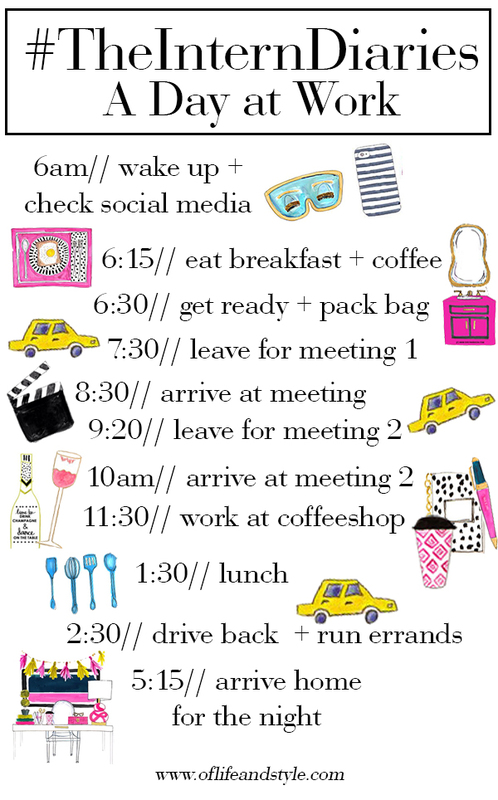 I adore Kate Spade and am thrilled that their adding more lifestyle categories to their brand! The cupcake one I'm most excited for! 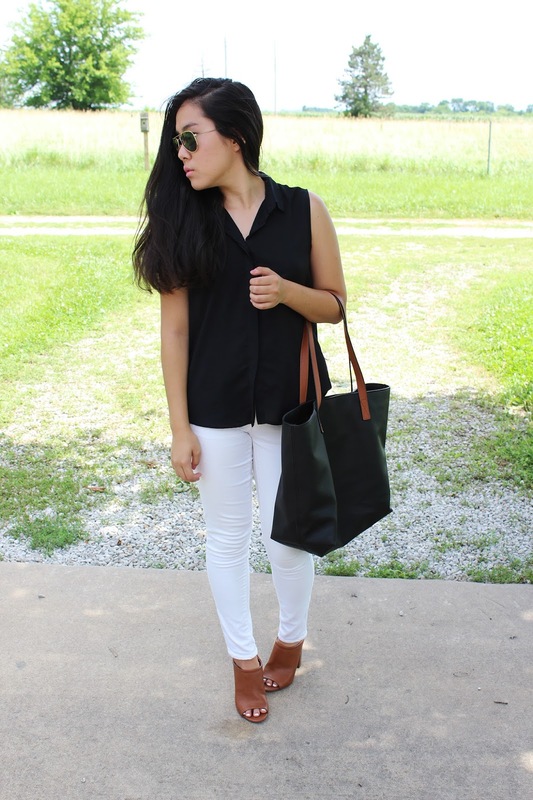 Love this simple and chic look on Christine. Perfect for brunch, lunch, dinner and drinks! I was never a huge Jake Gyllenhaal fan but after watching this he seems like such a fun and cool guy! Are you a blogger? Here are 12 proven ways to increase your blog traffic! I've been wanting to travel to Charleston for awhile now and after seeing the inside of this hotel I want to jump on a plane right now. Krista shares her 10 tips for planning your perfect vacation. I laughed so hard while watching this! I love Jimmy and Jake! Loving the new GBS website design! And they announced their next GBS event! I'm not a Kim Kardashian fan at all but her latest Vogue photoshoot is stunning. It's nice to see more of the "real, laid back" Kim K.
I'm thinking of a hair change for the fall and I'm loving this one! Thoughts? Chocolate chip walnut coconut pie? SIGN ME UP. I've been wanting to travel to Napa since I first watched the Parent Trap and here's Molly and Sally's recommendations. 20 iconic movie scenes that were completely improvised. This is such a cool read. I love their chemistry! This is just plain hilarious!! Like me and have wanderlust on the brain? Here's cheap airfare hacks that you need to know. So that's all I wrote for this week! I hope you all enjoyed and maybe learned a thing or two or got some inspiration! I hope you all have a great upcoming week and will see you tomorrow! What have you been loving on the Internet lately? Leave me a comment sharing! If I were to describe to you my style I'd have to say it's 75% timeless, sophisticated, classic pieces and 25% 'SoCal', boho, edgy pieces. I like to describe it as a mix of East and West coast vibes. A lot of the time I'm in 'preppy' outfits, a few of which you can see here, here, here and here. But there are other times where I like to channel my inner boho babe and let her loose. Case in point, this outfit. 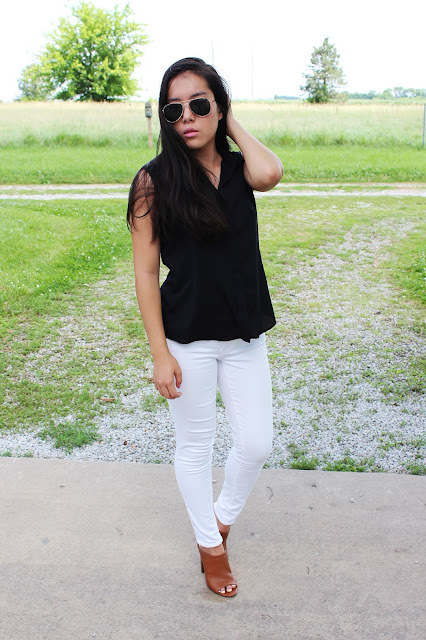 I was never an off the shoulder top kind of a girl until I saw Caitlin of Southern Curls and Pearls and Emily of the Sweetest Thing wearing them and looking fabulous, so I decided to try out the trend. I have to say I like it! I really like this top a lot. It fits great, and I love the scalloped shoulder detail. It's also super light and airy, perfect for these 95 degree days we've been having in Kansas lately! How do you wear the off the shoulder tops? Like the trend? Loathe it? Leave me a comment sharing your thoughts! 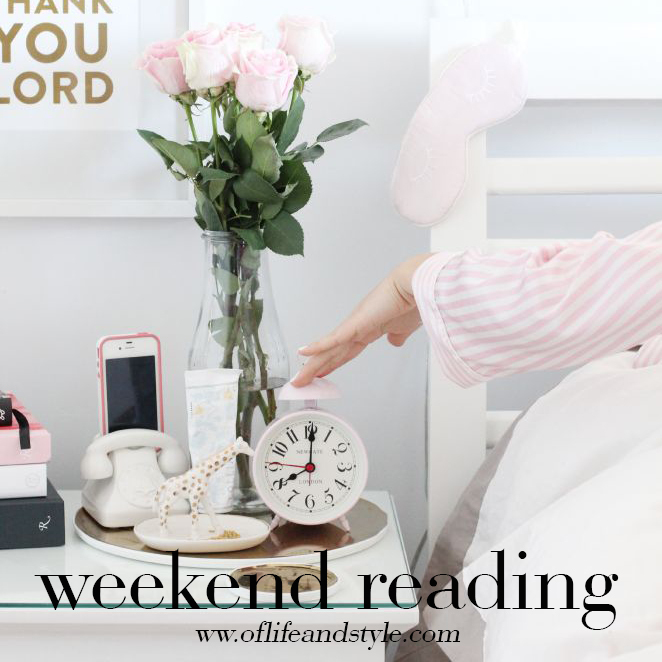 It's that time of the week; Weekend Reading list time! I've been super busy this week with the internship and spending time with friends before they head back to school. But I've managed to round up a few of my favorite links of the week! Enjoy! This is the most heartwarming article/video ever. I'm not gonna lie I teared up. I'm turning 21 in just a couple of months and this is a great reminder to live and do all those things on my 101 in 1001 list. I have always wanted to try a lobster roll and now I can! It looks delish! Loving this white on white, distressed denim look on Jacey! So excited to see this movie. I love Tina Fey and Amy Poehler. Thoughts on J. Crew's new budget friendly label? Classic Top Gun Rayban aviators on sale for $80! I'm a sucker for cute love stories, especially ones during WW2 and this one melted my heart. If you're a Gossip Girl fan check out this article on 54 things you didn't know about Gossip Girl! So there it is! My Weekend Reading list. I know it's a shortie again and especially with the blog but I've had a super busy week and didn't have a lot of time to write. I do have a lot of fun posts coming soon for back to school!